The small boxed beds, are more for looks than anything. The fruit trees were planted for years, and the boxes added later. The true roots are not actually in the boxes. I do fill them with some dirt, and have planted annuals there, just to look pretty, and remind me to water the trees during drought times. I think I will go ahead and plant my flowers, they are already up and growing, and need transplanting, then when the chives and topsets are ready, I will plant them there for next year! I decided to go ahead and plant the irises in the area of the elderberries, in this way, it will look more like an intentional growth and not so much like weeds growing there. Boy are the elderberries getting loaded with buds! They won't be in the walking area but in the general area of the elderberries, besides it is the sunniest location that I have. I think that will be pretty, especially if they ever decide to all bloom together. speakinig of elderberries (my favorite) i just found two beautiful variegated ones at SV nursery..and ordered them..one is goldedged and looks a lot like my aegopodium leaf wise..and the other is white..i also have a black lace one from a couple of years ago..as well as 3 others. i went crazy at that nursery today..got 4 goumi and 2 paw paw and 1 mtn ash and a large fruit hawthorn and 2 service berry besides the elderberries..also got 3 mulberries from another nursery today. Whoa that's a LOT of shrubs and trees!! Sounds wonderful! Take it easy planting them though. My kids started picking mulberries today. They're actually not *quite* as ripe as they could be, but still tart tasty. There are more ripe ones in the upper branches and the robins are busy feeding their fledglings. Our cultivated strawberries started to ripen over a week now, but our much awaited native wild strawberries are finally starting to ripen. We had a handful today, some not dead ripe but OH the flavor is excellent -- "Not sweet, but yummy!" those are hit an miss, aren't they. I got some good wild ones, but most are just starchy. well i did do something that doesn't seem to be obvious in most of the food forests, but a few, i planted lawn paths all around them. As I had a good bit of access to plastic edgeing I have put a lot of plastic edging in my gardens to separate the lawn paths from the planting areas..so as to keep the grass out. I have a terrible quack grass problem here in Michigan...as well as a gross lack of mulch available. As since the fire most of my food forest trees are very tiny babies, I'm just getting a start on the guilds around them. I have a walnut guild for the 3 walnuts that hopefully will still be alive this year, no leaves on them yet this spring. if they survive there is a Juglone barrier guild going between them and the fruit tree guild and chestnut guild..
these form a superguild in a 40 x 60 area, and there is a woods north of the superguild and there will be a water garden guild to the east of the entire mess. I also have a small area of ash trees with some wild raspberries in an area south of this superguild..and it will eventually need to be worked on as well as the are north of the pond and south of the woods . I can only do so much in one year..i started the superguild last year with the planting of the walnuts, and the berry hedges (blackberry, blueberry, and raspberry) and the other nut trees, chestnut, hazelnut, pecan and others) and also had some perennial vegetables already growing in this area as well as some herbs, and flowers and shrubs. This year this area got 3 pear, 3 apple, 2 cherry, lots more perennial and annuals and i have on order a lot more shrubs and trees..and will be adding divisions and cuttings from my other gardens. 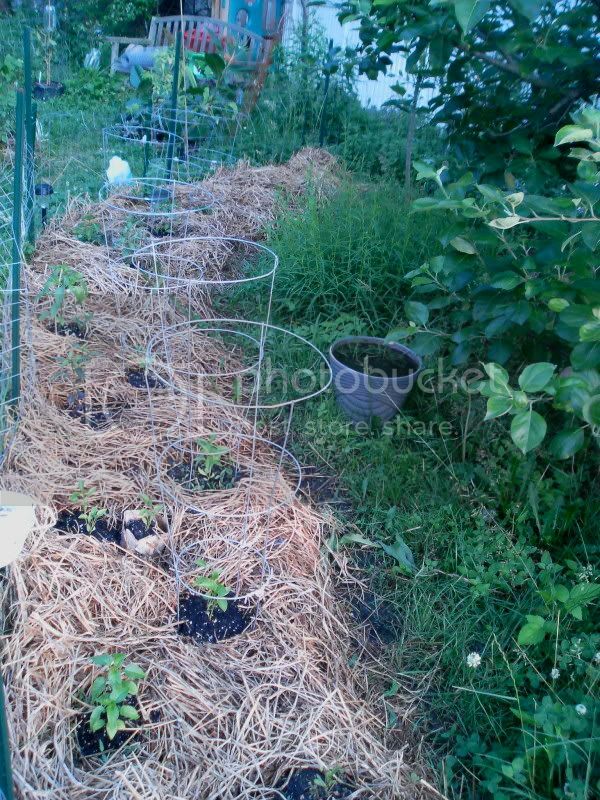 in the organic garden thread there is a list of the annual vegetables and herbs that I have planted so far this year. Pepper varieties planted here are: Aji Dulce, Quadrato d'asti Giallo, Q d'a Rosso, Tepin, Royal Black, Q d'a Rosso (DV), Jalapeno (Jr.), Cubanelle Banana, Fish, Anaheim NM, Jalapeno M, Czechoslovakian Black, Giant Orange Bell. There are some daffodils that were already here along the center of the bed, and the grey ceramic pot cover contains Koshihikari Rice with a couple of goldfish for mosquito control (I need to thin that to a single rice plant). How Fast does Food in the Soil Rot?